This is my last post about QuiltCon for the week. I think I blogged about it more days than I was there, LOL! Ellen Rushman presented the findings of her research study into Modern Quilting for her college thesis. She basically confirmed what everyone has been saying – Modern Quilting is part aesthetics/part attitude. 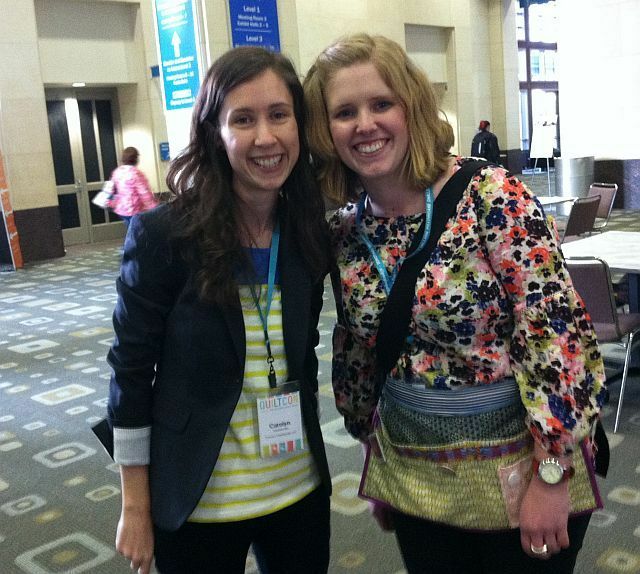 Both of these creative women were a joy to meet! Latifah Saafir is one of the board members of the Modern Quilt Guild. She also moderated a lecture/panel discussion on how to get one’s work into magazines. The info I gained in that one lecture was worth the entire trip to QuiltCon! 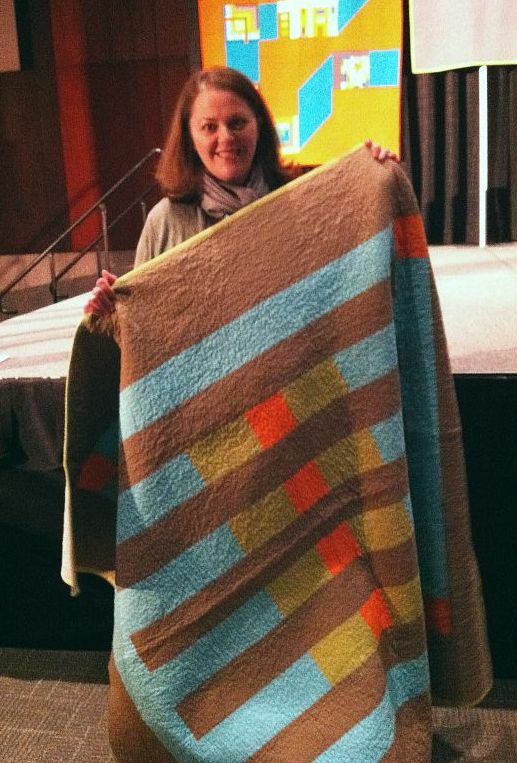 Heather Jones presented a lecture on Everyday Inspiration in Modern Quilts at QuiltCon. It was the first lecture I attended upon arriving and it really set the tone for the weekend. She showed numerous beautiful examples of how she took pictures of the world around her and interpreted them into breathtaking graphic quilts. I wish I had taken more pictures of her work, but fortunately her lecture and several others from the show are available for free on Craftsy – so check it out! Here I am, standing in between two lovely people, Vicki Anderson, CEO of Meander Publishing, and Amy Gibson from Stitchery Dickory Dock. Vicki was part of a panel that talked about Publishing Your First Book, and Amy did the wonderful free Craftsy 2012 Block of the Month series. I am surrounded by awesomeness! 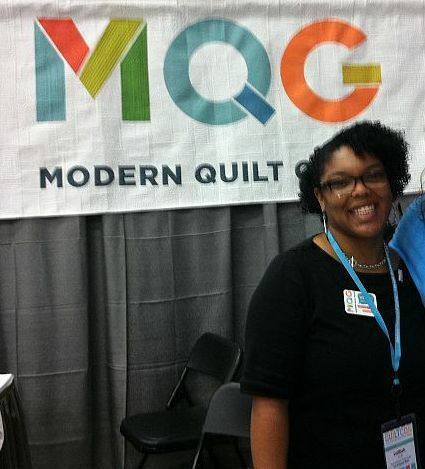 I have really enjoyed all your posts about QuiltCon and all the great photos. I think I need to save some money so I can go in 2015! Thank you, Christa! 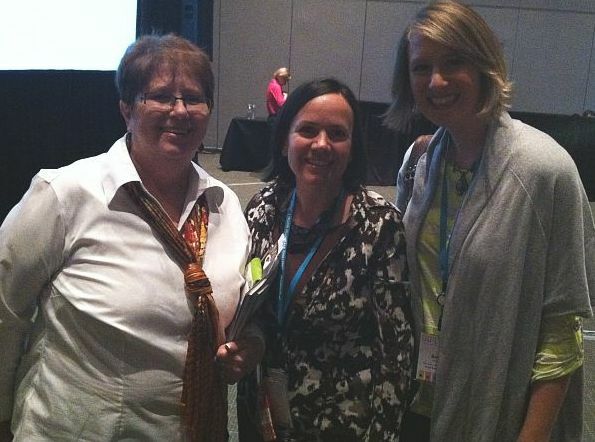 What a great series about QuiltCon — I really enjoyed seeing and hearing about your experience there.